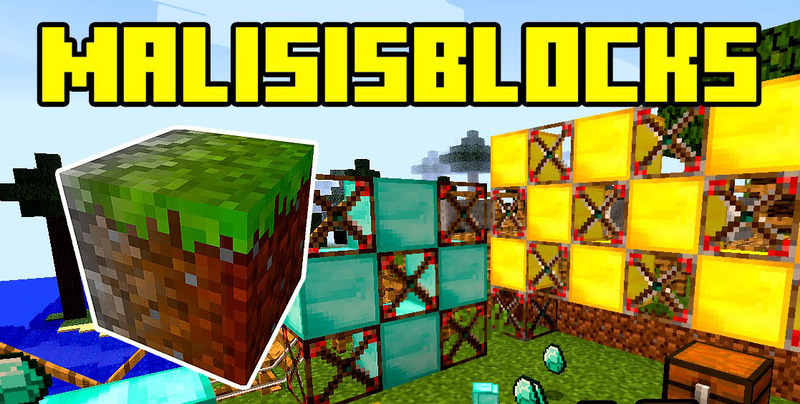 MalisisBlocks Mod 1.12.2/1.11.2 adds mixed blocks that takes two different blocks and mixes them together so that one side looks like one block and blends to the second block on the other side. Also, vanishing frames can be deguised as almost any other block and disappear when recieving redstone current. A little block that creates a redstone current when a player passes under. It can be placed on the walls, floors or ceiling. It doesn’t have the annoying click sound pressure plates have, and it’s safer too as it won’t let creepers enter your home sweet home. Vanishing frames that fade out when powered with redstone current. When powered, they transmit the current to their neighbouring fellow frames so you can make whole walls vanish into thin air. Once current is out, frames revert back to their normal state. Once placed in a world, you can right click on them with any normal block and the frames will copy and use the block textures. Frames come in four different materials : wood, iron, gold and diamond. Gold frames will only propagate to neighbouring frames that are copying the same block with the same metadata (ie : gold frame won’t trigger a frame copying a wool block with a different color). Diamond frames will allow you to entirely customize the behaviour. You can choose in which direction the propagation will occur, the delay and even the duration. The Vanishing Copier is an item that allows to copy options from a Diamond Vanishing Frame and paste it onto another one. When right-clicking with the item in hand, it opens the same GUI as the one for the Diamond Vanishing Frame and you can select here the options you want to apply to frames. You can also give it a stack of block to be copied. When right-clicking with the item in hand while looking at a Diamond Vanishing Frame in the world, it will automatically transfer the options to the frame. If a block is store inside the item, one will be transferred into the frame as well. If the frame already had a block in its slot, that block will be ejected into the world. When sneak-right-clicking with the item in hand while looking at a Diamon Vanishing Frame in the world, it will automatically copy the options from the frame into the Vanishing Copier. Also, it will transfer the copied block stored in the frame into the item if it can. Note that using the Vanishing Copier to transfer the copied block has another advantage : when placing a block into the Diamond Vanishing Frame inventory directly via the GUI, there is no way to indicate the block’s position. However, when using the item, the same rules as if the block was directly placed in world will apply. Examples : a furnace placed will face the place, stairs will be facing down if the top part of a side is clicked, etc.. The Block Mixer is a self powered machine that crushes blocks together. The result is a mixed block blending the textures of both blocks. If a light emitting block is mixed, the result will emit light. If a block of redstone is mixed, the result will emit redston current. Also, mixing a non opaque block allows to see through it. Ender pearl displays nether portal animation. Water bucket displays flowing water. Lave bucket displays flowing lava. Make sure you have already installed Minecraft Forge and MalisisCore.